Nothing brings a recipe to life like fresh lemons! 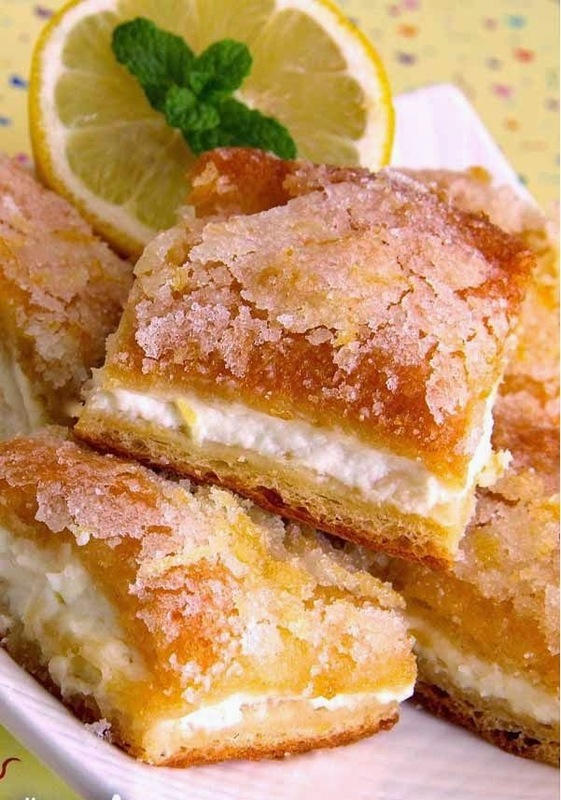 For a change of pace from the standard Southern-style lemon bars, you need to look no further! This recipe is easy and the taste is divine. I have also made this with Splenda® and low-fat cream cheese and they were just as wonderful. Preheat oven to 350 degrees F (175 degrees C). Line the bottom of a 9x13-inch baking dish with aluminum foil and spray with cooking spray. Press 1 can crescent roll dough into the bottom of the prepared baking dish, stretching to the edges. Mix the zest of 1 1/2 lemons and juice from 2 lemons together in a bowl. Beat cream cheese and 1/2 cup sugar into lemon zest mixture using an electric mixer until smooth and creamy; spread over crescent roll dough layer. Unroll the second can of crescent roll dough and layer over cream cheese mixture, gently stretching dough to the edges. Brush melted butter over crescent roll dough layer. Mix remaining lemon zest and 3 tablespoons sugar together in a bowl; sprinkle over butter. Bake in the preheated oven until top is golden brown, about 30 minutes. Allow to cool for about 20 minutes. Lift dessert from baking dish using foil; transfer to a cutting board. Cut into squares, leaving on foil. Return dessert to the baking dish and refrigerate until chilled, at least 1 hour.